An investigation into the oral health of captive orca whales is raising serious concerns about the health and welfare of these majestic creatures. Out of boredom and frustration, many of the whales turn to chewing on concrete and steel tank surfaces, causing wear and tear that leads to further problems. An international team of researchers has completed the first detailed investigation of the dental health of captive orca whales, finding damage in all of the whales studied. It’s the first time that a quantitative study has evaluated the health status of individual teeth—not just for marine parks, but for the zoological community in general. Disturbingly, much of the damage observed was self-inflicted—but a likely consequence of orca confinement. In the new paper, published this week in Archives of Oral Biology, the researchers documented two types of teeth damage. “First, whales will ‘chew’ on concrete and steel features of their tanks,” said Dr. Jeffrey Ventre, a former SeaWorld trainer and co-author of the new study, in an interview with Gizmodo. “This is a neurotic behavioral ‘stereotypy’ done out of boredom and perhaps to relieve anxiety.” Ventre says this behavior is similar to horses “cribbing” when they chew on the stalls in their barn, or tigers pacing back and forth in their small cages at zoos. As noted in the new study, more than 65 percent of the whales studied exhibited moderate to extreme tooth wear in their lower jaws, mostly as a result of this chewing behavior. The orcas often bite down on the steel bars of the gates, says Ventre, and this causes a painful fracturing of the tooth or teeth. “I have personally found teeth fragments on the bottom of Shamu Stadium in Orlando,” he told Gizmodo. Ventre, along with his collaborator John Jett of Stetson University, both worked with captive orcas at SeaWorld in Florida, and both observed this destructive behavior first hand. To understand the scope of the problem, Ventre and Jett investigated 29 captive orcas owned by SeaWorld Entertainment Corporation, which keeps whales in the US and in Spain. Using high-resolution photos, the researchers assessed wear and tear on the individual teeth of captive orca, looking for fractures, boreholes, and other signs of poor dental health. These photos—318 in total—were taken from public viewing areas at four facilities between 2013 and 2015 during normal viewing hours, and were “shot opportunistically” when an orca’s mouth was exposed. Each animal was identified “by an experienced examiner and confirmed by another,” the researchers write in their study. Dental damage was seen in every orca studied, with damage starting early in a whale’s captive life. Nearly half exhibited “moderate” mandibular coronal wear, that is, damage towards the tip of the tooth, while a quarter exhibited “major” to “extreme” wear. But this is only part of the story. Around 60 percent of the orca studied endured a dental procedure known as a “modified pulpotomy,” where a hole is drilled into the tooth to extract the soft pulpy tissue inside. This is done because, once a tooth gets worn to the point where the pulp is exposed, there’s increased risk of an abscess forming in the jaw, which can be deadly. But unlike dental procedures done on humans, the resultant hole is not filled or capped — it’s kept open for the rest of the animal’s life. This requires daily flushing with chemicals to keep the teeth empty of food and bacteria to prevent infection. Teeth that are drilled in this way are severely weakened, and any subsequent trauma is likely to cause fractures. In the majority of whales studied, the second and third teeth of the orca’s lower jaws were broken, a likely consequence of the drilling. For the researchers, the main takeaway of the new study is clear: killer whales are poor candidates for captivity. But that’s not all. The researchers also suspect that the two main stars of the movie Blackfish, Tilikum and Kasatka, died prematurely due, in part to antibiotic resistant pneumonia that was caused by years of antibiotic therapy to treat their teeth, which lowered their immunity and also created super bugs that were resistant to treatment. Ventre says the study wouldn’t have been possible without wild orca researcher John Ford, who provided the team with a 0 to 4 scale to measure dental health in the captive whales. Ford studies the teeth of wild orca whales, of which there are three main varieties: resident (coastal killer whales that subsist primarily on fish), transient (coastal whales that eat marine mammals), and offshore (deep sea orcas that feed on schooling fish). In general, the dental health of wild orcas is much better than captive killer whales, says Ventre, and the mechanism of wear-and-tear is slow. But in captivity, the researchers say dental problems were seen in young animals and even calves. In terms of what should be done, Ventre says aquatic parks should consider phasing out orca captivity through attrition, and refrain from capturing orcas for human entertainment. SeaWorld is currently phasing out orcas and its live entertainment shows, but this process will take time. Orcas can live for decades, and as this new study shows, the compromised condition of orca teeth make them poor candidates for release back into the wild. This study provides an unequivocal empirical confirmation of poor welfare in orcas confined to concrete tanks. The rigorous methodology leaves no room for any conclusion other than that there is a serious veterinary risk to captive orcas inherent in their confinement. The documented poor dentition in captive orcas is concerning on multiple levels. First, as we know, dental pathology and the kinds of invasive treatments made necessary by it cause severe pain and distress and there is no reason to think this isn’t the case in captive orcas. Second, dental pathology is associated with increased infection rate in all animals, including humans, so the poor dentition likely contributes to the rampant infectious pathologies seen in captive orcas and, by extension, the short lifespan. Third, the fractured and worn down teeth are caused by behavioral stereotypies and hyperaggression, both indicators of serious chronic psychological stress and pathology. 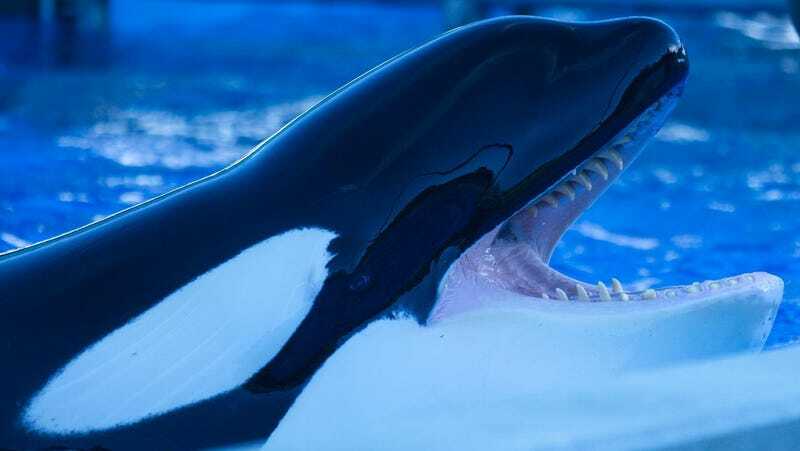 So, above and beyond the physical problems associated with poor dentition, the condition of these orcas’ teeth makes it clear that there is considerable psychological stress in orcas held in entertainment parks. This is really a well-done study. We also reached out to SeaWorld for comment and will update this post once we hear back. SeaWorld Cancels Inhumane Killer Whale Show, Announces New Killer Whale Show About "Conservation"